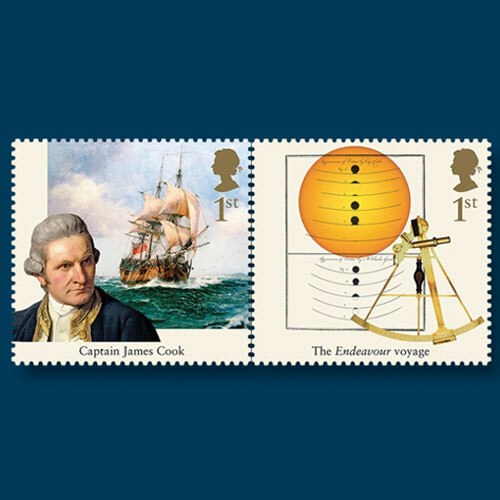 Royal Mail released a set of 10 stamps on 16th August to celebrate the 250th anniversary of a voyage led by British navigator and explorer Capt. James Cook. Three se-tenant pairs and four stamps in a souvenir sheet were released. Cook headed HMS Endeavour which set sail from Deptford, England, on 30th July 1768 and returned on 13th July 1771. The path-breaking voyage led to the discovery of eastern Australia, a mapping of New Zealand and an accurate observation of the transit of Venus. A group of scientists, botanists and artists led by botanist Joseph Banks were also a part of the Voyage. Bank’s team collected thousands of specimens of exotic plants, fauna, fish etc. One stamp features a portrait of Cook by Nathaniel Dance and Robin Brooks’ marine painting Triumph of the Navigators in the background. Another one shows drawings of the observations of the transit of Venus by Charles Green and Cook (1769) and a photograph of a sextant. One stamp features a portrait of Banks by Joshua Reynolds and two illustrations by a botanical draftsman Sydney Parkinson of a red-tailed tropicbird and a red passion flower. Another stamp features the chief mourner of Tahiti and a canoe scene drawn by Tupaia, a Tahitian knowledgeable high priest and navigator who died on the ship. One stamp features Parkinson artwork of scarlet clianthus and a portrait of a Maori chief with full facial moko, who are the indigenous people of New Zealand.